The shallow pool is part of the original plaza design by Harry Seidler & Associates. 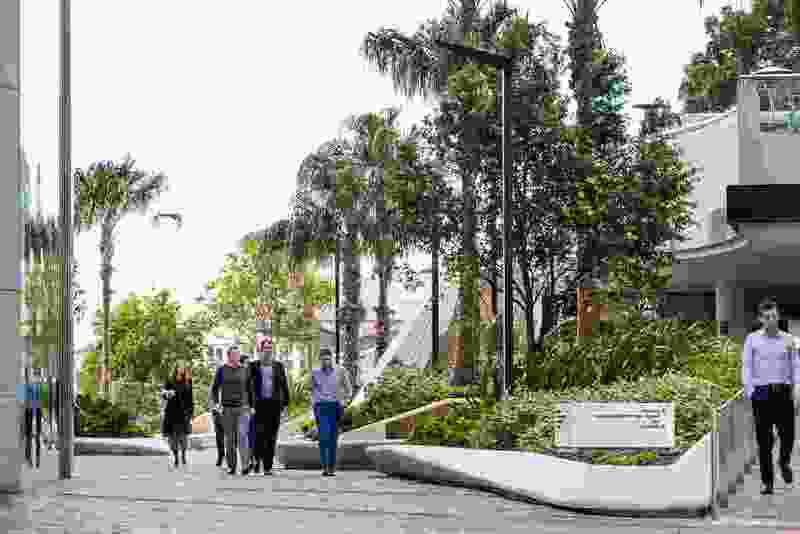 Opening just two years before Brisbane hosted World Expo 88, Brisbane’s iconic Riverside Centre was considered a groundbreaking project in its day. Among its many achievements, it successfully connected the city with the river via a generous publicly accessible plaza at ground level. 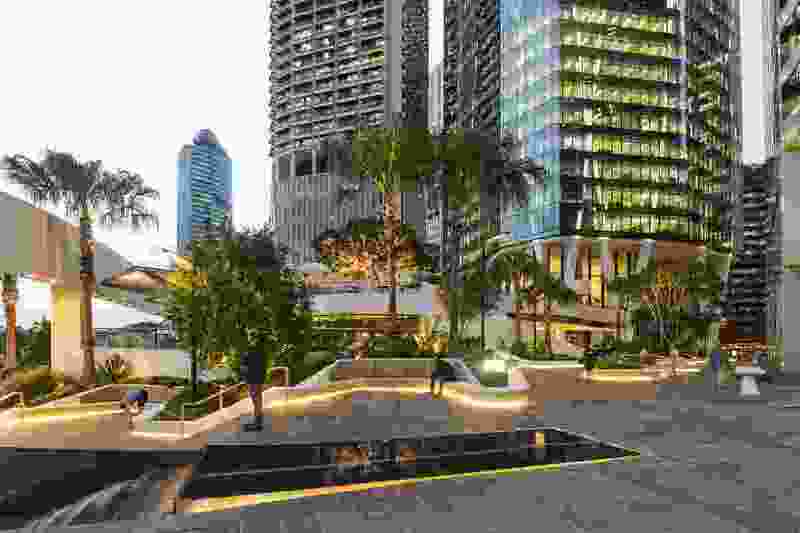 Designed by the celebrated architect Harry Seidler, the modernist tower complex triggered a series of similar developments on neighbouring dock sites that incorporated large public plazas. 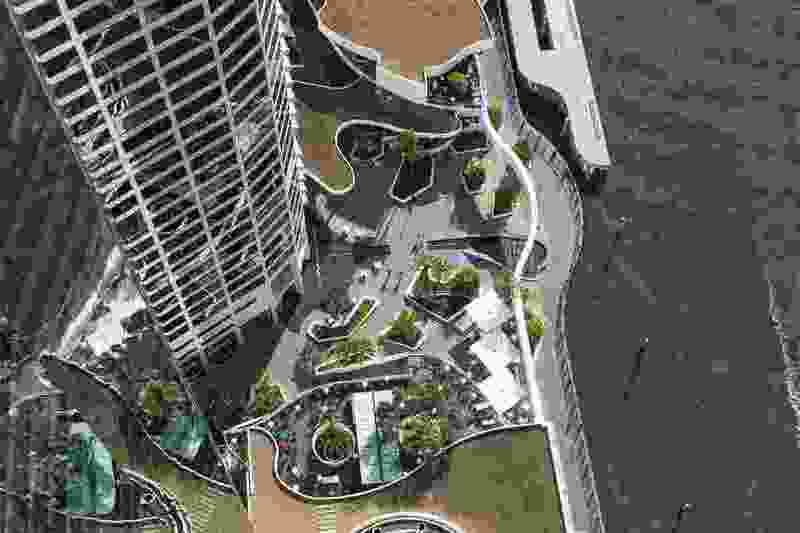 Influenced by the open, paved squares and piazzas of Europe, they embraced the river rather than turning their backs to it – a movement that culminated in the opening of the South Bank precinct in 1992. 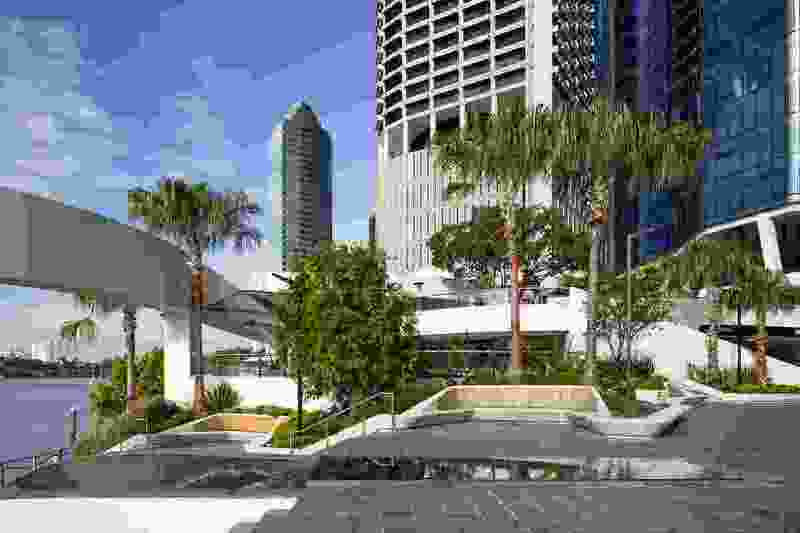 But while Seidler’s plaza was transformational for the city in the late 80s, its landscape diminished over time for various reasons, and it became a place that was stark, hot, and windswept and people simply didn’t want to dwell there beyond the time it took to have a smoke break. 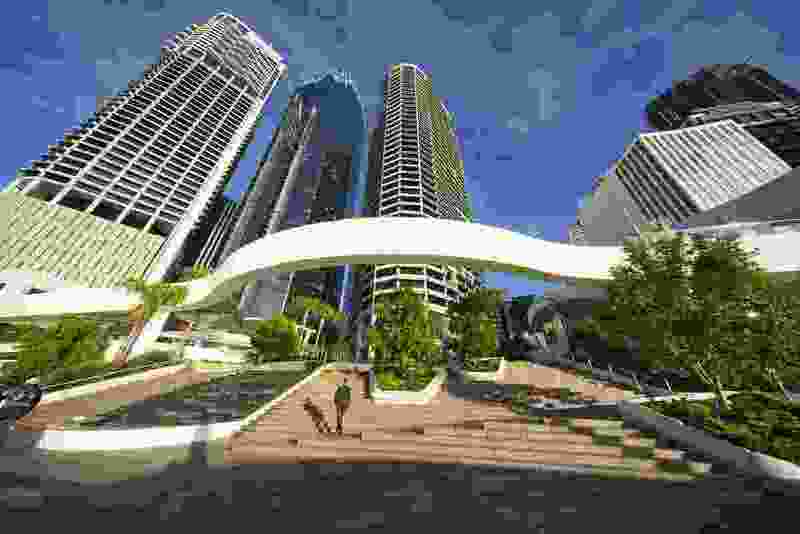 There were limited shade trees or sheltered places to sit, and being open to the wide Brisbane River, the plaza suffered from high winds and searing heat. 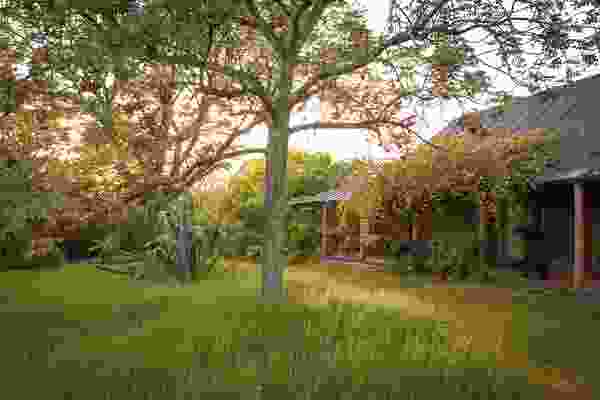 Importing a European idea to subtropical Brisbane proved problematic, unsurprisingly. LED strip lighting is integrated into the concrete planter modules. 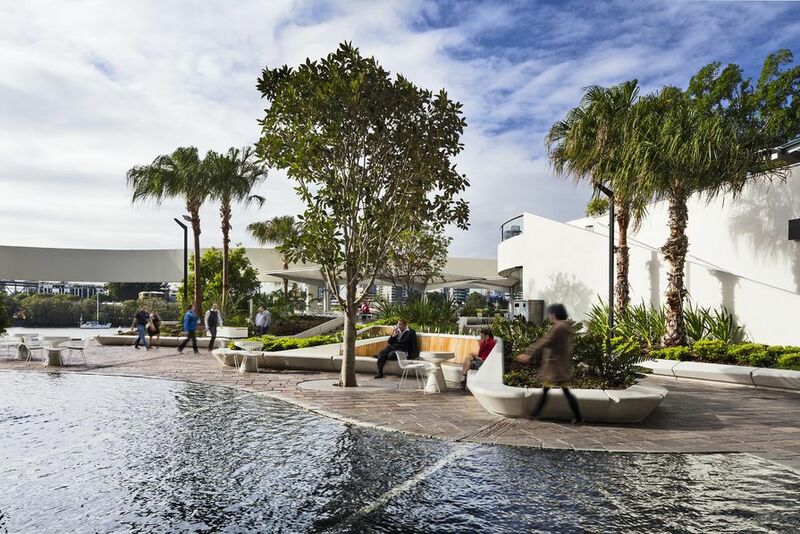 In 2013, landscape architecture practice 360 Degrees was invited to reimagine the heritage-listed plaza. 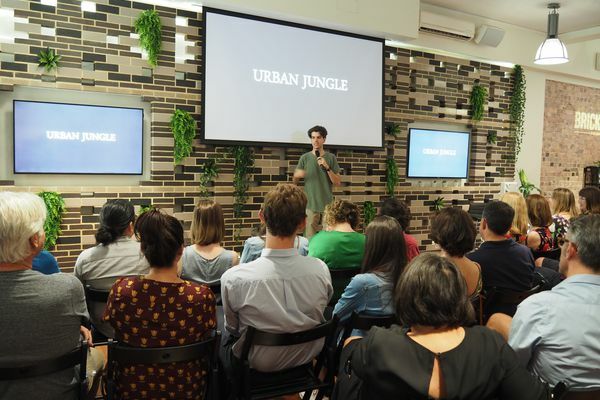 Liam Bowes, Brisbane studio director at 360 Degrees, explains that while the task was a little daunting, it certainly wasn’t insurmountable. “[The project] challenged our thinking on what scale of intervention would be appropriate, and our very early concepts reflected this caution,” he says. 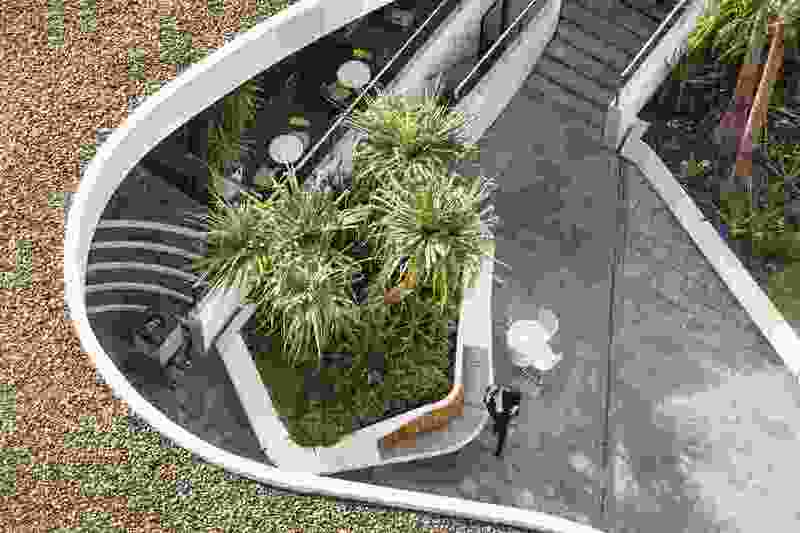 “With our client’s support and guidance from Greg Holman at Seidler’s office, we were encouraged to develop a design that completely reimagined the landscape, creating a new site-responsive plaza while respecting the Seidler legacy.” The plaza also had to work together with a new interior and lobby fitout. 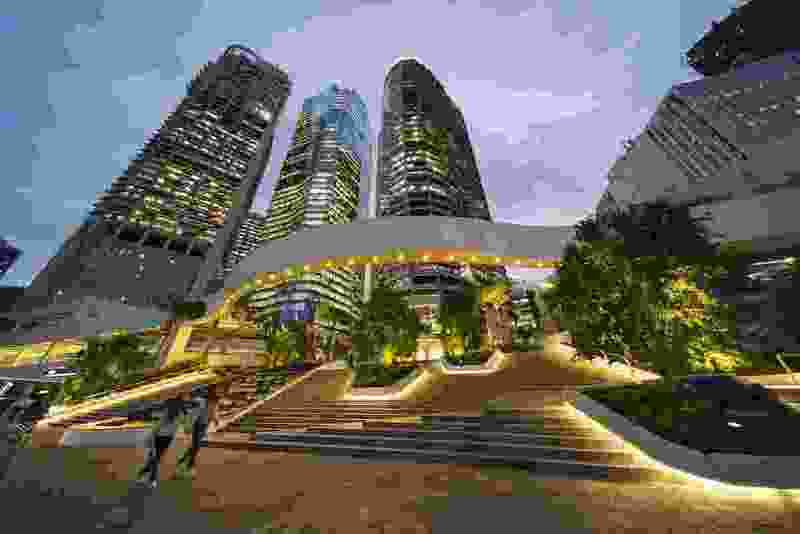 Confronting the issues of wind and heat, 360 Degrees’ initial response was to introduce as much greenery to the plaza as possible. But this was easier said than done. On one hand, the designers had to grapple with a heritage listing that prevented any permanent alterations to the paved surfaces (including adding any additional drainage points), while on the other, an underground car park meant there were strict weight restrictions for any new elements introduced at ground level. 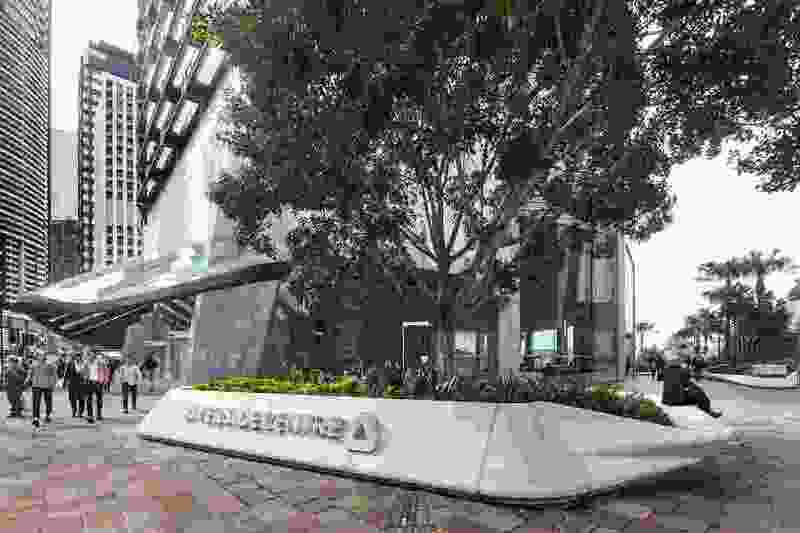 The Riverside Centre is located on the Brisbane River. Working with the client (GPT Group) and Harry Seidler and Associates, 360 Degrees modelled a network of lightweight precast concrete planter modules that could twist and fold around the building and extend down a series of stairs to the river to provide seating, shelter and soil for plants. These could be removed if necessary without any lasting damage to the heritage-listed paving. With the assistance of 3D modelling program 3ds Max, the design was modulated into 41 unique parts that could be prefabricated into 260 high-quality, Class 1 concrete panels off site. Timber seating was integrated into the sinuous design, with higher backs located in the windier areas of the plaza to provide protection. LED strip lighting was recessed into the base of the planters, adding an elegant touch. 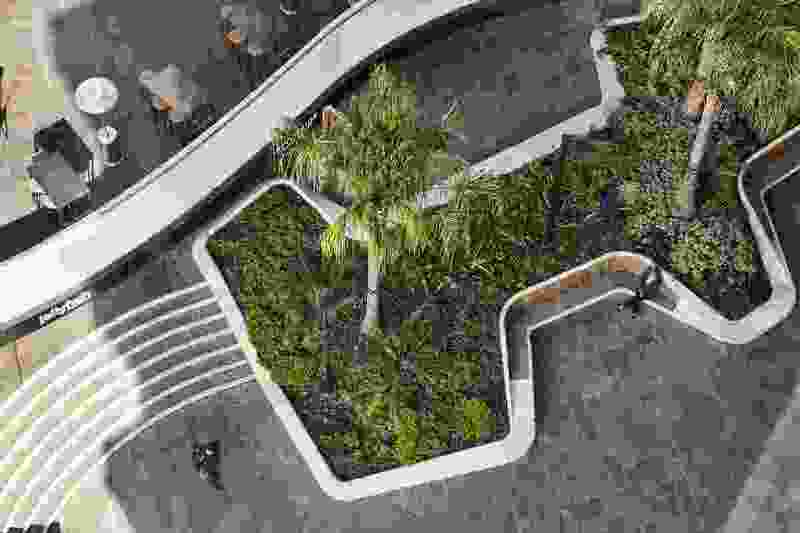 A special lightweight soil medium was used in the planters to allow for larger shade specimens to be incorporated – such as mature Pandanus spiralis (pandanus palms) and Waterhousea floribunda (weeping lilli pilli) – before the overall weight limit was reached. High backs on some of the integrated seats provide shelter from wind. 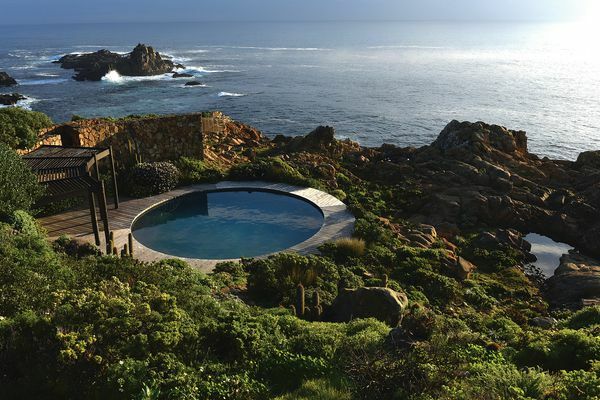 The mostly endemic planting scheme certainly provides the visual interest, with more than 2,987 plants of 35 species creating a landscape full of contrasting colours and textures. Viola hederacea (Australian native violet) spills over the edges of several of the planters, while further back Crinum pedunculatum (swamp lilies) provide height and strong formal contrast to the many horizontally trailing plants such as Plectranthus nico and small shrubs such as Hymenosporum flavum ‘Gold Nugget’. In shaded areas, silver foliage plants such as Plectranthus argentatus (silver spurflower) have been used to stunning, illuminating effect. Apart from a few minor teething issues (such as some trouble with water connecting to the irrigation system), the place is thriving and the quality and composition of the planting is outstanding. 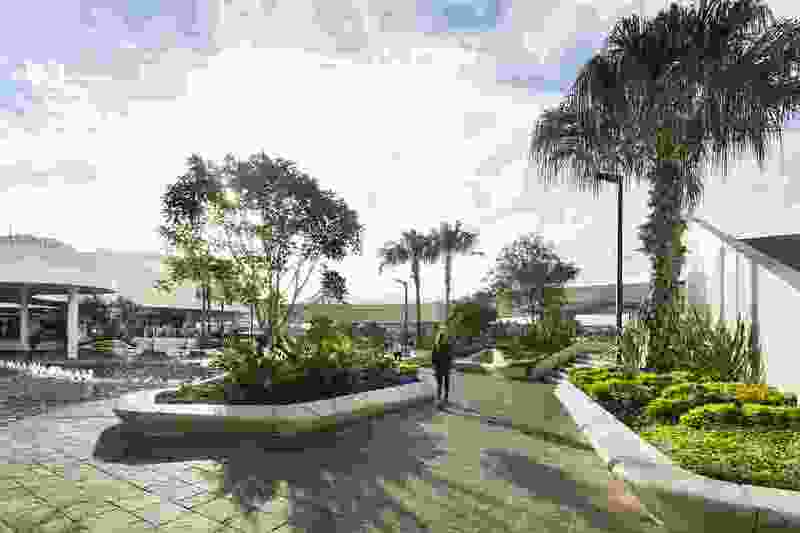 When I remark on how unusual it is to see such complex planting in public spaces, Bowes insists that planting design is integral to their practice and they are passionate about increasing planting volume and diversity in urban areas. 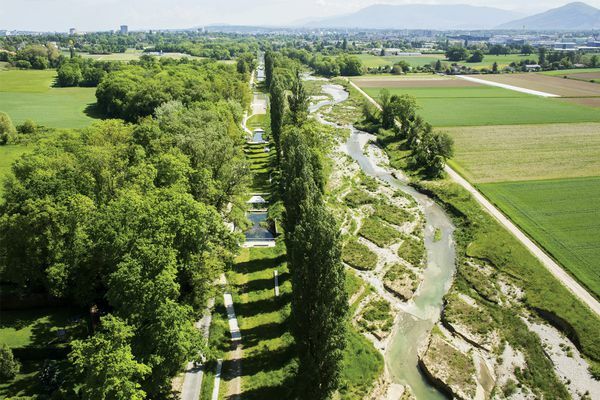 “Planting richness and complexity is achievable with careful species curation, it doesn’t have to be dependent on high-maintenance regimes. 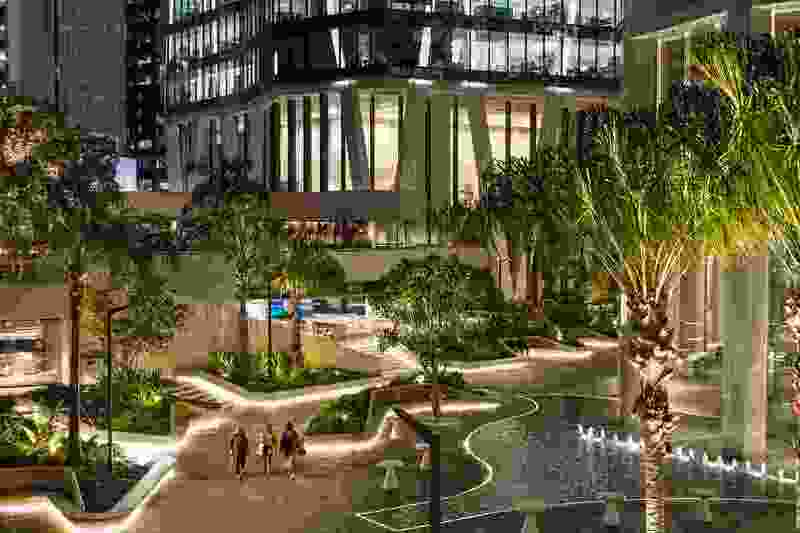 And it brings a familiar ‘garden’ feel and scale to this space, which seems to be appreciated by the public,” said Bowes. Since reopening, the Riverside Centre has seen a big increase in people visiting and using the space. On the day of my visit almost every seat is occupied, and not just by corporate types on smoke breaks, as was previously the case. “It’s bittersweet seeing the planting being ‘occupied’, but on the other hand we wondered whether this sort of activity might help the project qualify for a sustainability award!” said Baffsky, tongue planted firmly in cheek. 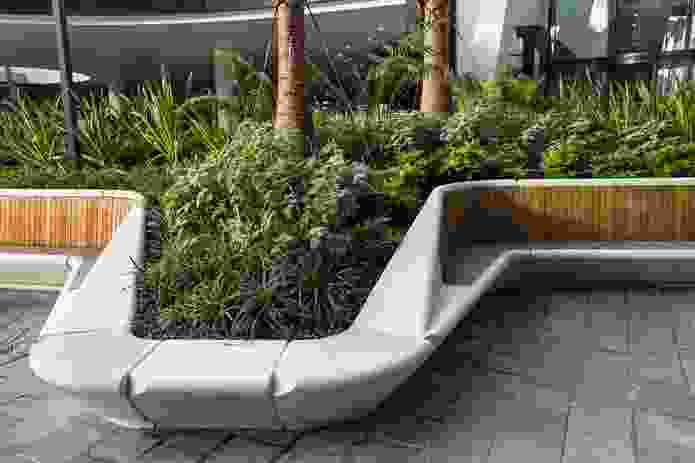 The planter modules are filled with diverse compositions of plants. There are now plenty of seating opportunities in the plaza. 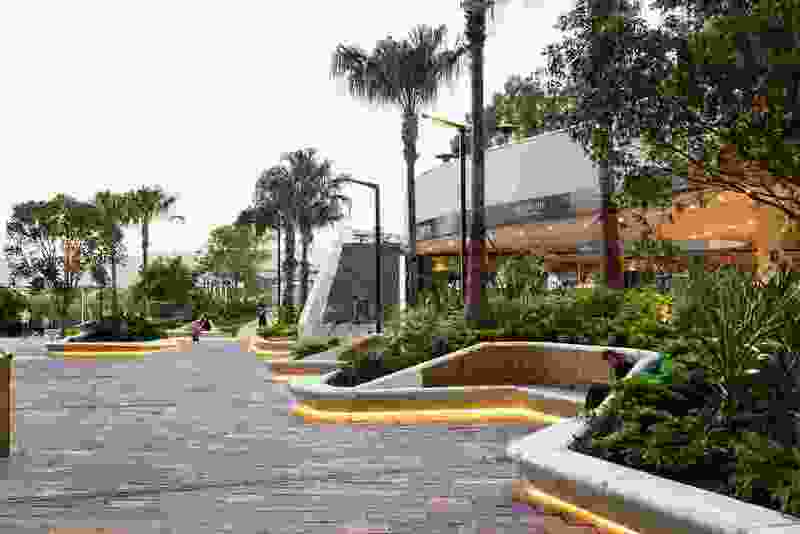 The network of planter modules wrap around the perimeter of the plaza like a ribbon. The many layers of the Riverside Centre plaza as seen from above. New signage and wayfinding was also part of the revitaliszation project. 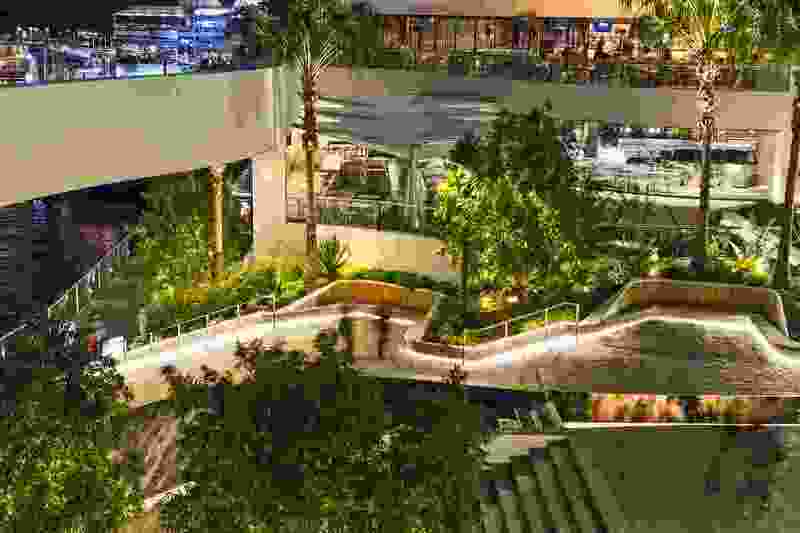 Planter modules appear to spill down the stairs toward the river. The plaza as seen from the river at night. Approaching the revitalized plaza from Eagle Street.